Join us on an in depth journey through magical Vietnam, traversing the country from south to north and discovering the many attractions that lie along the way from rice paddy fields of Mai Chau to the intricate network of waterways in the Mekong Delta. Witness the hustle and bustle of Ho Chi Minh City, the old-world charm of Hanoi, ancient neighbourhoods of Hoi An and dramatic limestone pinnacles of Halong Bay. Day 1 - Join trip in Hanoi. Stroll around the historic old quarter. Arrive in Hanoi and drive to our hotel in the heart of the capital. Hanoi is an attractive city, ideal for families, effortlessly combining the vibrancy of Asia with tree-lined shaded boulevards, leafy parks and tranquil lakes where residents can often be seen performance Tai Chi early in the morning. Head out this afternoon to explore the city on a guided walking tour of the Old Quarter, a labyrinth of narrow lanes full of children playing, old men huddled over board games and artisans selling everything from fresh flowers to art work. Pavements are filled with the rich aroma of steaming noodles, snacks, stir-fried delights and 'bia hoi' (fresh draught beer) just waiting to be sampled. Day 2 - Hanoi. Watch locals take lakeside yoga classes, explore night markets. This morning join our Explore leader to see more of Hanoi, visiting the One-Pillar Pagoda, the tranquil Temple of Literatures and the Mausoleum of Ho Chi Minh lying in state. The afternoon is then free to perhaps take an optional cookery class, or explore Hanoi's elegant French Quarter by cyclo. In the evening there is the chance to witness a remarkable performance of traditional water puppetry (optional activity). Set on a flooded stage, the stories tell tales of legendary heroes and everyday life, with dragons and unicorns often sharing the stage with fireworks and naval battles, alternatively head out to sample the delights of Vietnamese cuisine at a local restaurant. Day 3 - Scenic drive to Mai Chau, bike through paddy fields past tranquil traditional villages. Hemmed in by hills and set in a tranquil valley, Mai Chau is a world away from the hectic pace of life of Hanoi. The four hour journey provides a glimpse of rural life in the north of the country passing through villages surrounded by paddy fields. On arrival, check-in to our hotel with fine views of local villages distantly related to the tribes in Thailand, Laos and China, lunch is included at the hotel. This afternoon head out on a biking tour along rice terraces of the Mai Chau Valley dotted with stilt houses. The ride provides opportunities for panoramic views of paddy fields, spectacular karst cliffs and verdant valleys around you, a truly spectacular setting. On the way home, pass by Van Village, home to the White Thai people. Enjoy dinner and an overnight stay at our comfortable eco lodge featuring a swimming pool to cool off in after an afternoon of cycling. Day 4 - Drive to Xam Khoe Village, home to Thai ethnic minority, home cooked lunch with a local family. After breakfast, drive to Xam Khoe Village and set off on a walking tour to Buoc Village populated by the Thai ethnic minority people, the terrain is mainly flat, sticking to the valley floor traversing the network of banks separating rice paddy fields. Enjoy local hospitality in a simple stilt-house as a home-cooked lunch of regional specialities such as Goi cuon (spring rolls) or Pho (Vietnam's national dish, a light beef or chicken broth flavoured with ginger and coriander, to which are added broad, flat rice noodles, spring onions and slivers of chicken, pork or beef) prepared by a local Thai family. Short drive back to Mai Chau with a stop en route to explore the magnificent Van Mai Valley. Day 5 - Continue to Ninh Binh, likened to an inland Halong Bay. This morning is left free to enjoy a leisurely breakfast. Drive to Ninh Binh in the afternoon. Whilst the town itself is fairly unremarkable, the area around Ninh Binh is beautiful, known for its impressive cave formations and network of waterways, lakes, temples and towering limestone peaks. Day 6 - Bike ride through paddy fields to visit Dong Tam Village. Afternoon boat trip to explore cave complex. This morning stretch our legs as we cycle the back roads through picturesque local communities to Dong Tam village. After a break at a temple we head through the countryside towards the spectacular limestone peaks of Van Long, surrounded by paddy fields and meandering waterways. The landscape is truly spectacular. Our destination is the nearby village of Vuon Thi, where we enjoy a delicious traditional lunch prepared by friendly hill tribe villagers. After lunch, take a sampan ride along the charming Ngo Dong River to a cave complex, with time to explore the network of caves in the area. Return to Ninh Binh. Day 7 - Cruise Halong Bay on a junk boat, sea kayak around the bay. Leaving Ninh Binh after breakfast, we drive approximately four hours to the Gulf of Tonkin and the breath-taking scenery of Ha Long Bay. A UNESCO World Heritage Site, and one of the most visually impressive landscapes in South East Asia, Ha Long Bay is the setting for our overnight cruise. There are between 10-18 en-suite cabins (all bedding is provided) with a restaurant, bar and sundeck area. Boarding the boat in time for lunch, we set sail and visit Sung Sot Cave which means 'Amazing Cave' which is the largest of its kind in the area with numerous stalactite and stalagmite limestone formations in an impressive cavern. We then spend the rest of the afternoon exploring the bay before our Junk boat finds its mooring for the evening. Please be aware, the boat may not be exclusive to Explore and consequently we may be sharing with other travellers. Day 8 - Sea Kayaking & take the Reunification Express sleeper train to Hue. After a morning's sea kayaking and cruising around the bay, we head back to shore and disembark the boat at Bai Chay Beach before driving back to Hanoi. In the evening board the Reunification Express overnight sleeper train to Hue, Vietnam's old imperial capital. Travelling by train with a family is often cited as a real highlight, we travel in soft sleeper class, with four passengers sharing each compartment with all bedding provided; watch the world go by as we slowly make our way south passing villages, rivers and vast plains along the way. Please note, breakfast will not be provided on the train, so there will be time to pick up snacks for the morning before boarding the train. Day 9 - Travel to the Tu Duc Royal Tombs. Try kite making (and flying!) and visit the Imperial Palace. Arriving in Hue this morning, seek out many of the highlights of this former imperial capital of Vietnam including a visit to the Royal Palace with its Terracotta Warriors guarding the entrance and the Thien Mu Pagoda, home to the oldest monastery in the city. We also visit Mr Cu's house who was a national champion kite flier for Vietnam who shows us how to make traditional Vietnamese kites which you make and decorate with symbols such as dragons, birds and peacocks. Once assembled, we fly them at the nearby Citadel. Day 10 - Hoi An. Martial arts lesson. Make traditional wood paintings, cruise on the Perfume River. Journey to Trieu Son village, located by the Perfume River on Hue's outskirts for a guided walk and boat ride. First stop is Sinh village where we meet a local family that specializes in making wood paintings. Later in the morning, take to the open road on a leisurely cycle ride around the village and along countryside lanes to Thanh Tien village, famous for paper flowers. Criss crossing an intricate network of paddy fields, we arrive at Tien Non village where we board our cruise boat, taking us back to Hue (total cycling distance is approximately 6km). An included martial arts lesson is our next stop with a visit to a dedicated martial arts school that practices the Vietnamese art of Kinh Van, Vietnam's equivalent to Kung Fu, based upon defence techniques from the actions of a tiger, cobra, and bird. The owner's ancestors were chosen to guard the Vietnamese king; knowledge has been passed down from generation to generation to our host, who has been intrusted with teaching this ancient art. Travel over the Truong Son Mountains and through the Hai Van Pass as featured on the TV programme, Top Gear, to the historic merchant seaside town of Hoi An. Day 11 - Free day in Hoi An, opportunity to spend the day on the beach. The morning is free to wander through the historic heart of this World Heritage Site, taking in the wonderfully preserved buildings of what was once one of the busiest trading outposts in South East Asia. Discovering this delightful town, we recommend an early morning visit to Hoi An's fish market which presents the perfect setting for some great photographs. Wander through Hoi An's historic collection of traditional wooden houses and Chinese temples. This afternoon you could hire bicycles and explore the surrounding countryside, experience a gentle river cruise, or grab the chance to visit some of Hoi An's famous tailor shops. Alternatively take a 20 minute taxi ride to the nearby coast to spend the day on the beach. Day 12 - Fly to Ho Chi Minh City. Explore the old quarter in cyclos (cycle carriages with a seat). This afternoon we will experience a different side of Ho Chi Minh City, away from the major sights where we take a walk through Old Saigon's back alleys. We make our way to District 3 by cyclo (cycle carriages with a seat at the front) and turn off the main thoroughfare and into the maze of narrow streets of this bustling district. Our walk takes us past ramshackle shopfronts, through local markets selling anything from colourful fruit to bootleg DVDs, and past houses, churches and schools, all squeezed into the small buildings that line the narrow alleys. It's a fascinating inter-connected community here that is a stones-throw from the city centre, yet feels a far cry from the modern buildings and throngs of tourists. We stop at a local stall for a traditional Vietnamese coffee (brewed coffee served sweet with condensed milk) where we can also sample 'Banh Mi' - a Vietnamese take on the humble French baguette - freshly baked and packed with a combo of traditional and more exotic, aromatic ingredients. The walk ends the so-called 'secret weapons' bunker'. A small unassuming 'tube house' nestled in a quiet neighbourhood hides a trap door in the floor, concealing a basement stocked full of rifles, grenades and ammunition. The bunker played a key role in the TET Offensive of 1968, it was the base from which the Viet Cong's "Team 5" launched their assault, and its location was only revealed after the end of the war. We have some time to explore the house and bunker, filled with decommissioned weapons and photographs, news clippings and memorabilia from the wartime. Day 13 - Discover the Cu Chi Tunnels which the Viet Cong used as a hideout during the Vietnam War. After breakfast this morning drive to visit the infamous Cu Chi tunnels. First constructed by the Vietnamese during their colonial war with the French, the tunnels were later greatly expanded and went on to achieve notoriety during the Vietnam War, when they served as an underground command base for 10,000 Viet Cong troops. Exploring Cu Chi gives some idea as to the conditions that the Vietnamese had to endure (the tunnels are narrow and can be quite claustrophobic). The afternoon allows for more time in the city including an optional visit to the waterpark, a great way to cool off from the mid-day sun. Day 14 - Drive to the Mekong Delta, overnight homestay, explore villages by bike. Leaving the city, journey to the Mekong Delta and board a boat to the start point of our cycle ride. We cycle for around 10-12 km along the flat Cai Thai village path with constant views of the delta as we wind our way around its many tributaries. The route is often shaded which is helpful to combat the humidity (the boat can pick up cyclists at various stopping points if required). Along the way, we visit Mrs Nani's home who will show us how to make rice paper in the traditional way and Mr and Mrs Chin's home who will provide refreshments that include her famous 'Banh Tieu' (traditional doughnut). Returning to our cruise boat for lunch on-board, we continue sailing along the delta to our night stop. Transferring from our cruise boat to a sampan craft, a small traditional boat regularly used by the villagers to travel along the delta, make the short journey to a traditional homestay, set in a lovely garden setting with a main lounge area and dining room, accommodation is en-suite (shower and toilet) with traditional décor throughout. After settling into our simple but clean accommodation, embark on a gastronomic experience as we take part in a Vietnamese cooking lesson. Typically our hosts usually give a traditional dancing and singing show to accompany the evening meal. Day 15 - Morning cruise on the Mekong Delta. Drive back to Ho Chi Minh City where the trip ends. Leaving the homestay behind, we take a cruise in the Mekong delta spending time exploring the numerous small floating markets and soaking up the atmosphere of this unique trading point, a vast network of rivers and islands that crisscross agricultural villages, paddy fields and mangrove swamps. After our visit, we drive back to Saigon where the trip ends in the afternoon (Day rooms are available). Why not extend your trip to Indochina with three nights on the tropical white sand beaches of Phu Quoc Island? Nestled in the warm waters of the Gulf of Thailand this Vietnamese island is 90% national park, a thick-rainforest interior framed by idyllic white sand beaches. Easily accessible by a short flight from Hanoi, Siem Reap or Ho Chi Minh City, this is a great way to unwind after an action-packed trip in Indochina. Visit https://www.explore.co.uk/holidays/phu-quoc-beach-extension for more details. Dong Ba market is the oldest trading venue in Hue spanning almost 16,000 square meters on the northern bank of the Perfume River. Be sure to visit the food court on the ground floor to sample authentic Vietnamese dishes such as pho, banh khoai (stuffed omelette), and fresh spring rolls. Guided tour USD $18 per person. Taking part in a cookery lesson is a great way for the whole family to get involved in learning about the complex flavours that makes Vietnamese food so delicious. Choose from a morning or afternoon cookery class. USD $ 39 to USD $45 per person. Visit the Reunification palace USD $2 per person. Pack essentially for hot weather although December through to February warmer clothing is needed for the North. Bear in mind that the region is tropical (humid) and can be hot. Lightweight rainwear is advisable at all times. The north is cold at night during the winter. Casual clothes are the most practical. Comfortable walking shoes and sandals. Binoculars for wildlife viewing, torch, water bottle, insect repellent, high factor suncream, good quality sunglasses and a lip salve with sun protection. An overnight bag and swimming gear and towel is also recommended. Extend your stay on the beach: Why not extend your trip to Vietnam with three nights on the tropical white sand beaches of Phu Quoc Island? Nestled in the warm waters of the Gulf of Thailand this Vietnamese island is 90% national park, a thick-rainforest interior framed by idyllic white sand beaches. Easily accessible by a short flight from Hanoi, Siem Reap or Ho Chi Minh City, this is a great way to unwind after an action-packed trip in Indochina. Click here for more details. This extended holiday to Vietnam spends additional time in the north of the country, known for its rich heritage and beautiful scenery. Spend time in Mai Chau riding along the pathways dividing rice paddy fields and Ninh Binh known as an inland version of Halong Bay with its steep limestone pinnacles and intricate network of inland waterways to explore. An ideal destination for families who want to explore the best of South East Asia and enjoy travelling on a variety of transport options - bus, train, boat, flight and bicycle. Vietnam is an incredibly welcoming country, and caters extremely well to families of all ages. There are a number of easy active elements to this adventure including trying out Vietnams answer to Kung Fo, sea kayaking in the stunning Halong Bay, kite flying and cycling along the Delta - this adventure also allows us to meet local people and visit their homes including when we make kites and rice-paper. A great trip from one end of the country to the other. At the end of your trip you can extend your tour with a four night tropical beach extension to Phu Quoc (trip code VB) known for its expansive white sand beaches. 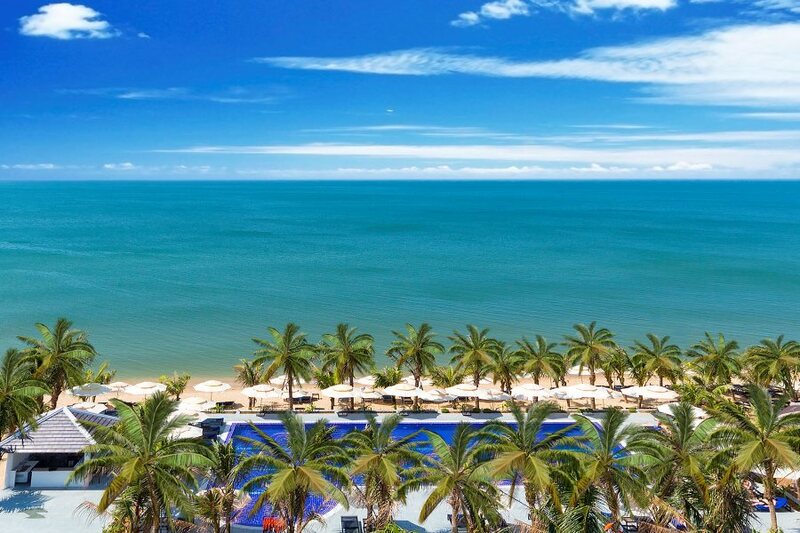 Located off the south west coast of Vietnam, enjoy three nights at the for star Amarin Resort and Spa from £249 per person based on twin share including return flights from Ho Chi Minh City, transfers and daily breakfast.